The Faculty of Management at UBC's Okanagan campus and the Sauder School of Business at UBC's Vancouver campus have established an alliance that will further open doors for research innovation, resource efficiencies, career service expansion and student opportunities. The alliance capitalizes on each faculty's unique strengths -- the heritage of business education at the Vancouver campus and the culture of innovation at the Okanagan campus. "We are building upon the synergies between two established faculties, and there is tremendous potential for cross-pollination between two vibrant campus cultures," says Doug Owram, Deputy Vice Chancellor of UBC's Okanagan campus. "This means enhanced opportunities for students on both campuses, and a platform for new relationships with the BC business community." The alliance is anchored by the recent appointment of a cross-campus Dean of Business and Management. 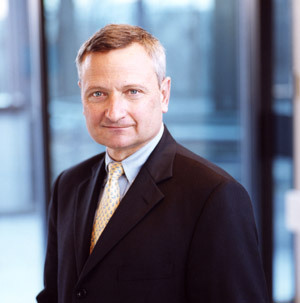 Daniel F. Muzyka, Dean and RBC Financial Group Professor of Entrepreneurship at the Sauder School of Business, takes on the role of Dean of the Faculty of Management. He notes that the new alliance between UBC's business and management faculties will help focus resources at the provincial, national and international levels. "UBC is the umbrella under which business education at both campuses will grow," says Muzyka. "While sharing UBC's and Sauder's commitment to excellence in business education, the Faculty of Management can become a global leader in distinctive areas such as service management, hotel and tourism, and small business and enterprise." Dean Muzyka will be assisted by a cross-campus executive whose role is to ensure consultation and realization of partnership possibilities. Key areas of collaboration will include research, career services and co-operative education, alumni relations, and student recruitment. The Sauder School of Business (Vancouver, BC) is Canada's leading academic business school, recognized globally for its contributions to the transformation of business practices through innovative research and teaching. The school has over 31,000 alumni in 74 countries around the world. The Faculty of Management at UBC's Okanagan campus (Kelowna, BC), in alliance with the Sauder School of Business, offers both Bachelor of Management and Master of Management degree programs. The first UBC Bachelor of Management graduating class received their degrees in June 2009.